QuickBooks | LAE Business Services, Inc.
Small companies are always struggling to find more profits with less time and resources. Construction and architectural companies are faced with these same struggles, but they often have the additional challenges of high equipment costs and the competition of bidding on jobs against a tight pool of opponents. Trying to maintain a tight leash on costs while growing the business and staying competitive can be a daunting task. There are a few small business areas where additional attention now can mean more profitability in the long run. Understanding of your company’s overhead- Look at all those expenses that you would still have to pay if no one worked for a week, like rent, utilities, equipment loans, salaries, web site, internet and other costs. Once you have a firm grasp on your fixed costs, it will be easier to bid on jobs and more importantly, make a profit from the jobs you win. Accounting on and off the job site- Trying to juggle your small business accounting on napkins and post-its from the field or an antiquated accounting system can cost your business thousands or even tens of thousands in lost time and missed revenue. 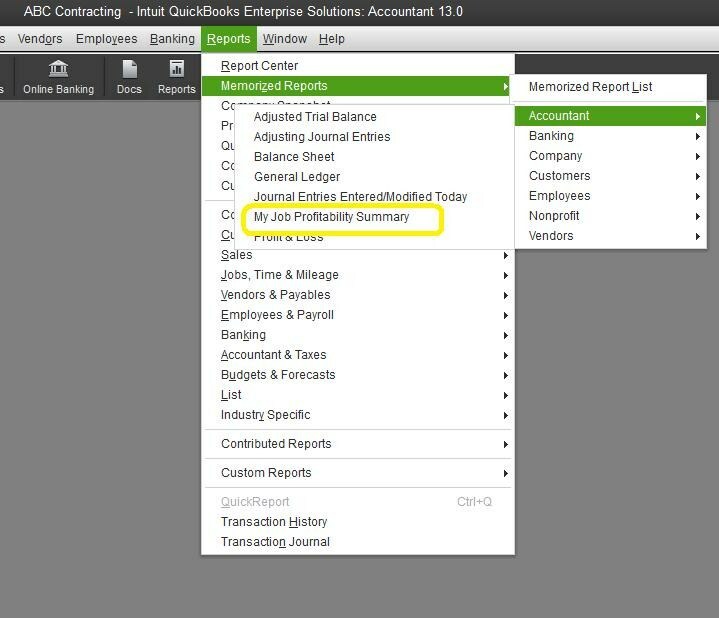 Invest in a productive and efficient small business accounting software program like QuickBooks. Consult with a small business accountant about the best way to set up your accounts and how to generate reports. You’ll need to access this data time and time again, so an investment in solid advice at the start will enable you to do the job right the first time. After you have a good accounting practice in place, you’ll be far better prepared to process invoices in a timely manner. Better accounts receivable means better cash flow. Change Orders- Sustaining a tight control on client’s change orders can be the difference between being profitable or not. Change orders are those requests that fall outside the scope of your original contract and can add up to hours of re-estimating work and lost time if you’re not careful. Failure to keep up with change orders can also mean that your business is losing considerable dollars and opportunities for profitability because you’re doing work that you’re not being paid for. Change orders serve as an excellent source of increased revenue, too. Because you already have the original contract, you don’t need to compete with other construction firms to win the business – you’ve already got that! Put a tracking system in place to organize, manage and complete change orders in the field and translate those modifications into actual billable time on the accounting side. 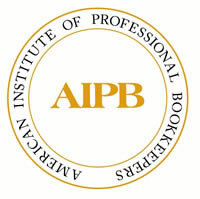 Which takes us to the next step – accounting. Job Analysis- Having a good estimating and accounting system will also save you the repetition of freshly estimating every job. 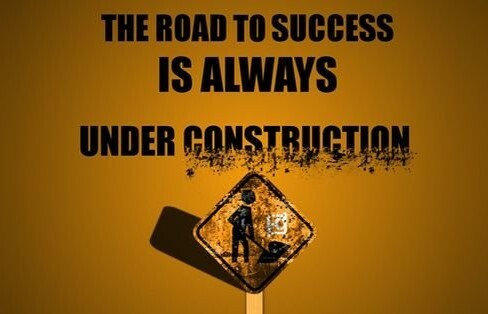 In construction as in many other businesses, there are similarities from job to job. Having an electronic reference will equip you with a track record from which you can gauge the profitability of your pricing structure including the raw materials and labor required for each job. When you take the opportunity to reflect on previous projects, it will enlighten you to the success of the job, stumbling blocks and enable you to learn from mistakes so you can be more profitable with future contracts. Training- This portion of your small business management translates into many aspects of your business. Invest in your staff by providing growth and enrichment opportunities. This benefits both the employees and your company, resulting in employees who are more loyal, resulting in less turn over. Absence of employee retention can wreak havoc in a small business, especially when those individuals in strategic positions leave the company. The cost to search for and hire replacements can impact your company both financially and emotionally as the strain of double-duty roles on the remaining employees can be exhausting. By providing in-house training on responsibilities, roles, safety and procedures, you will have a more efficiently operating organization. Set aside time to draft procedures and maintain them will streamline repeated questions, curtail errors and in the case of safety, can prevent costly and serious injuries on the job site. Procedures aren’t etched in stone but they should be documented, reviewed by your team and then revisited regularly. As procedures change, they should be revised with a journal log so you can see who updated the procedure, what changes were made and why. A business is a business, but each type of industry has different obstacles where the company can become stuck if the right reinforcements aren’t in place. Construction firms have unique needs; speak with an experienced small business advisor in your area to learn how you can become more profitable. 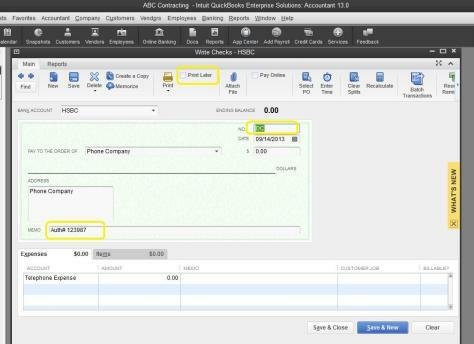 The first thing you will need to do is record this returned check in your accounting system. You don’t want your accounts receivable and bank account to be misstated. 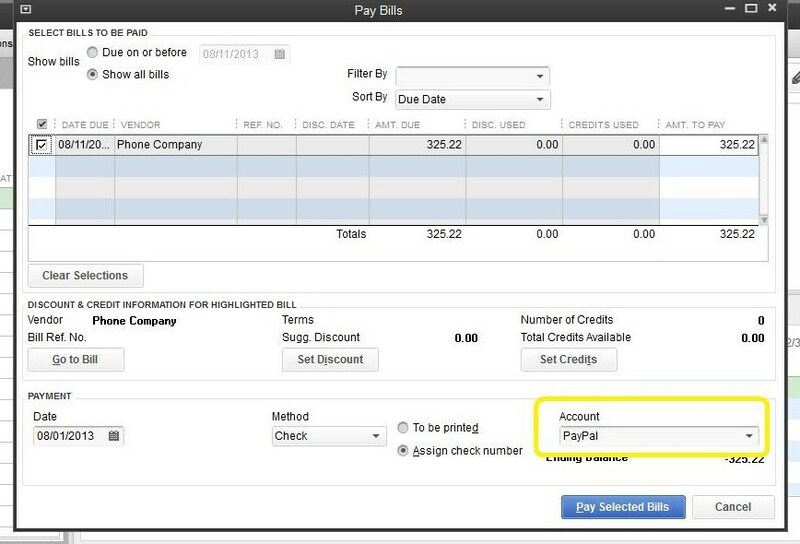 If you don’t have this item set up already in your QuickBooks you want to create a new item “other charge” for your Item List: Bounced Check. 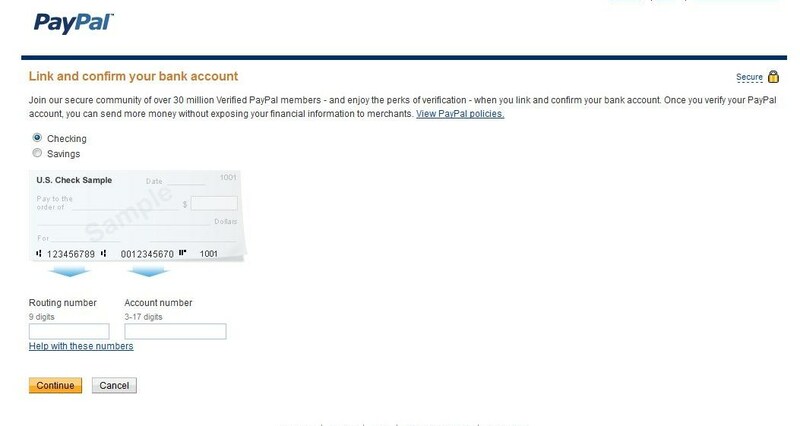 Leave Amount at zero, tax code as non, and for the Account choose your checking account. Also create another “other charge” item: Bad Check Charge — no amount, non-tax, and for the account set up an income item named “returned check charge”. 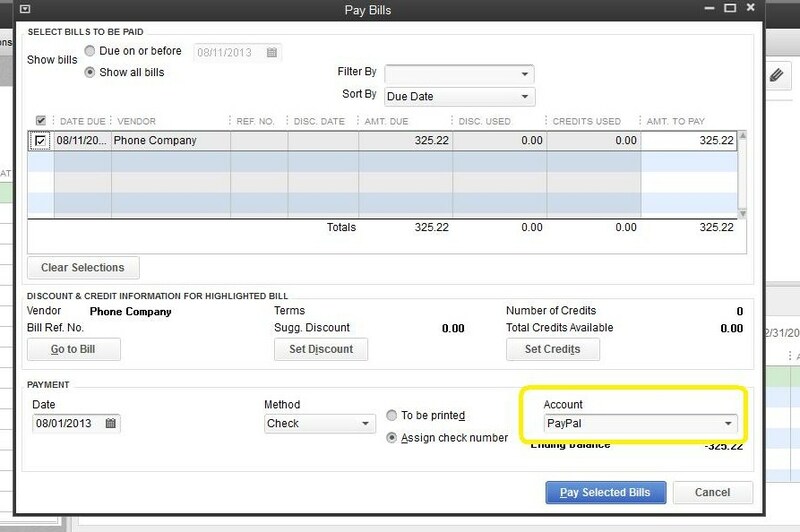 Then create an invoice to your customer using these two items. Invoice for the amount of the check on item Bounced Check and for the bank charge on the Bad Check charge item. (Include a description of the NSF ck# number, date.) This will have the effect of backing out the deposit and will match to your bank statement. When you receive a replacement check from your customer, receive it as you would any other payment. The Purchase Discounts Lost account does more than simplify bookkeeping—it brings attention to money-saving discounts that your firm may be missing. 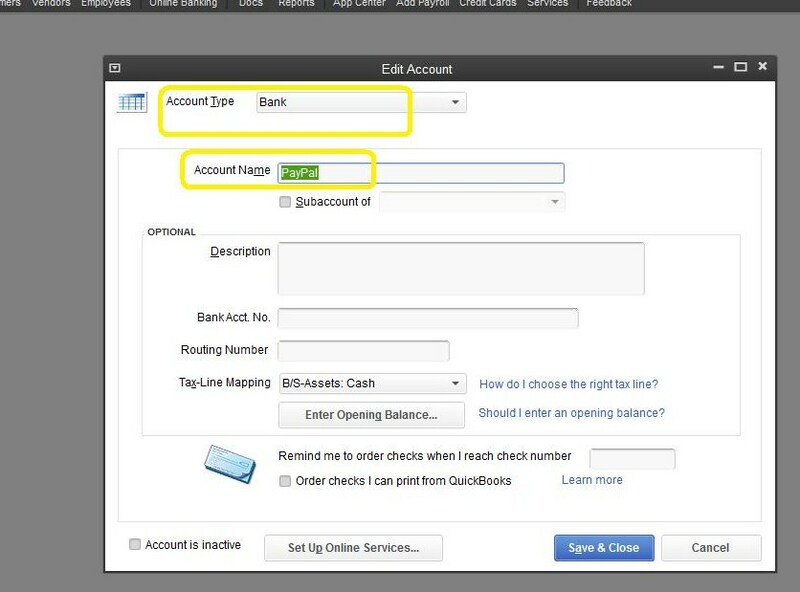 With online banking and debits cards we are using our checking accounts for so many different types of transactions… So how do you record a check in QuickBooks® when it’s not a physical check, but rather a debit card or an electronic transfer? It’s easier than you think… You begin with the same “write check” window to record non check transactions as you would to write a physical check. 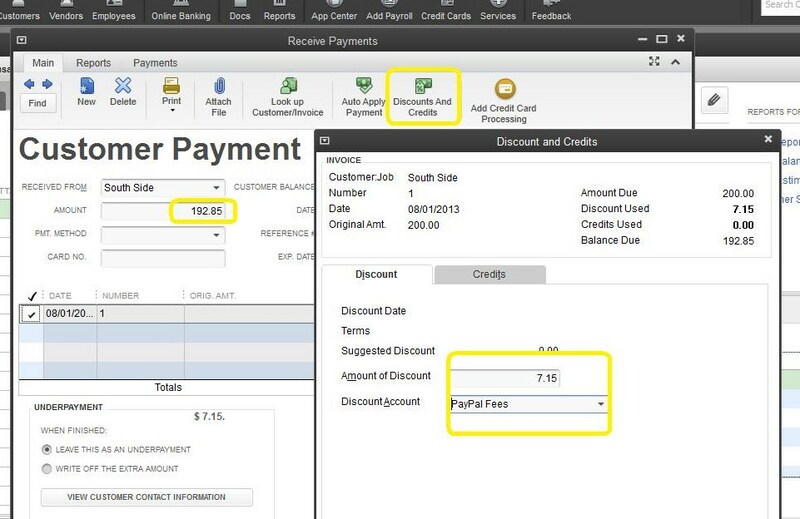 Do not use the field called Check# to insert the reference number or approval code for debit card receipts, this is not the best use the software and will only add to the confusion when you reconcile your bank account. Consider instead using the following abbreviations to identify when a transaction is a debit card purchase or some other type of transaction other than that of a physical check. If you want to record the reference number or approval code, insert it in the memo field. 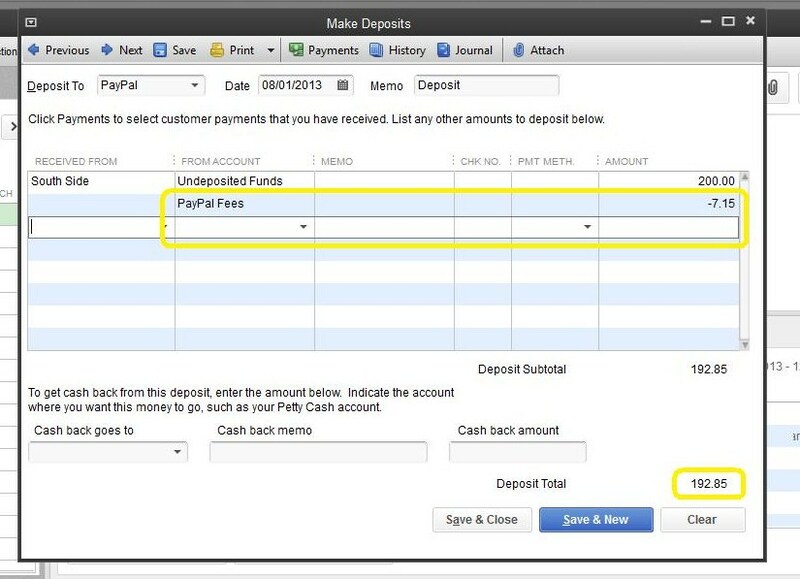 Make sure to uncheck the “print later” box, then you will be able to insert the abbreviation applicable to your transaction. Below is a list of abbreviations you can use for the “write check” screen, you can create your own list of abbreviations too. Remember to be consistent with the abbreviations you use; if not it will make reconciling a very tedious task. Check# is always used when issuing physical checks. So you’ve finally found the report in QuickBooks that fits your needs perfectly and you want to be able to access it quickly, easily and often…memorize it! Select any report, modify it by “customizing” and “filtering” it with the information you want to see and then memorize it. 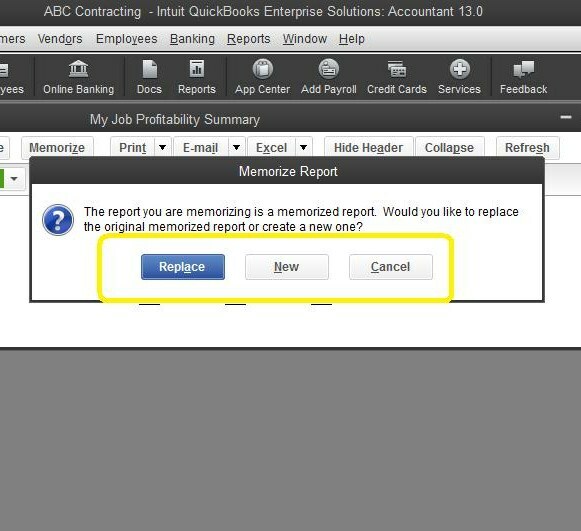 Whenever you change the settings for a report, you can memorize the report with the new settings and save it in the QuickBooks Memorized Report List. Then, when you want to create a similar report, just go to the Memorized Report List to find it. 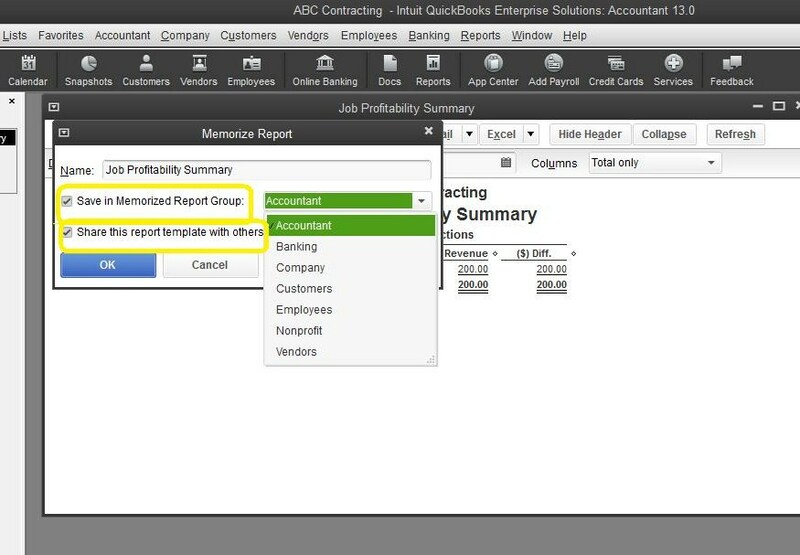 Please note: QuickBooks memorizes the report settings, not the data in the report; so if data changes in your company file the data in the report changes. 1. Customize a report with all the information you need, click Memorize at the top of the report. 2. If you have changed an existing memorized report, indicate whether you want QuickBooks to replace the earlier report, using the same name or create a new memorized report with a new name. 3. In the Memorize Report window, enter a title for the report. 4. If you want to assign the report to a memorized report group, choose “Save” in “Memorized Report Group”, and choose the group from the drop-down list. 5. 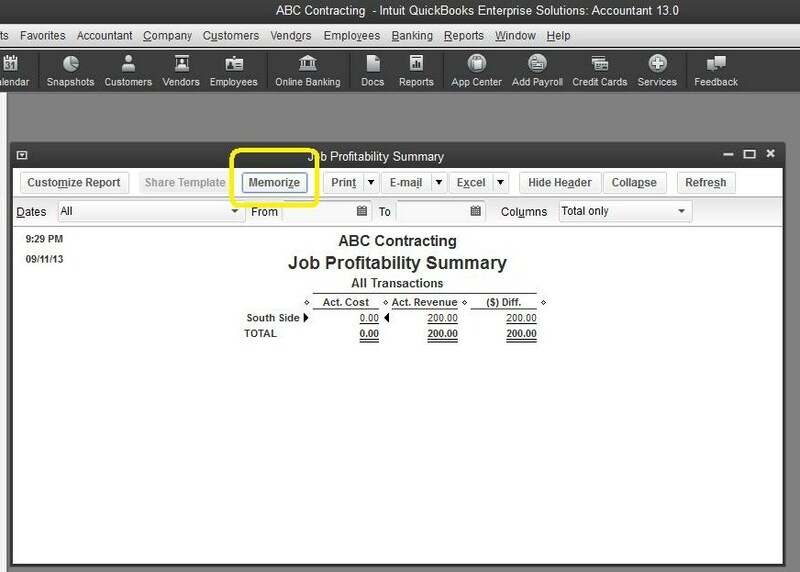 If you run several businesses or have a multi-user QuickBooks installation, choose the sharing option for your custom reports so other employees will be able to access the report templates quickly and easily. Happy memorizing… Need more information? Chargeback – A word no business owner like to hear! What is a chargeback? A chargeback occurs when a customer’s credit card is approved at the point of sale, but then is reversed when the customer files a dispute with their card issuer. This is the most common reason for a chargeback, but there are a few others, such as computer glitches or miscommunications. However, any chargeback could mean lost revenue for your company as well as incurring fees. Your buyer contacts the credit card issuing bank to dispute a specific charge. 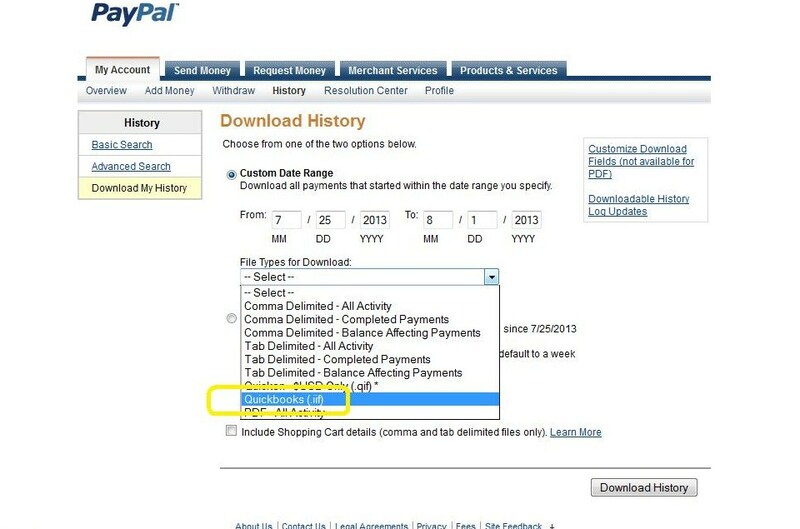 The credit card issuer contacts the appropriate credit card association, who then notifies merchant of the chargeback. Your merchant services alerts you of the chargeback via fax, mail or email and requests supporting documentation to contest it on your behalf. To dispute a chargeback, you must reply to the correspondence by the indicated reply-by date. Your merchant service provider will review the details of the chargeback and the documentation provided by you. When deemed necessary your merchant service provider submits the evidence to the credit card issuer in an attempt to reverse the chargeback. If the chargeback is successfully disputed on your behalf, no further action is required. If the credit card issuer does not resolve the chargeback in your favor, you may be liable for the chargeback. Keep in mind that your merchant service provider can only forward your chargeback response to the credit card issuers for review. The credit card issuer is ultimately responsible for determining the resolution of chargebacks. If you’re found liable for a chargeback: You’ll receive a notification via mail, fax or email from your merchant service provider with details about the chargeback. You’ll be charged for the full amount of the chargeback. Different orders from the same buyer count as separate chargebacks. Please be sure to respond to each information request you receive individually so that all of the chargebacks can be properly contested, if possible. The Fair Credit Billing Act protects customers’ rights to dispute charges for a number of accepted reasons. Generally, a policy that allows no refunds will not be upheld by the credit card associations. Because credit card issuers require that any documentation be received within a certain number of days, prompt replies to our information requests are necessary if you intend to contest the chargeback. Once this time frame has expired and the credit card issuer has resolved a chargeback in the buyer’s favor, they will not review any additional documentation. The final status of a chargeback may not be determined for several weeks or occasionally several months after it is initiated. Not answering chargebacks in a timely manner can be detrimental to your merchant services account. If you agree that the customer should be refunded, go ahead and refund them, but you must still answer the chargeback notice. Each chargeback that goes unanswered counts as a strike against you, too many and your service provider will revoke your account. Unsure of where to start, consider engaging a bookkeeper or an accountant to set up your bookkeeping system. If paying a seasoned professional doesn’t fit your budget, you could hire a college student who’s majoring in accounting to assist you. 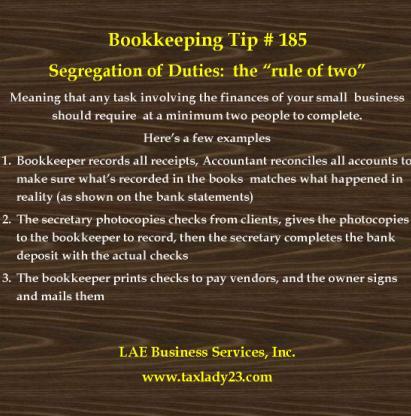 Meaning that any task involving the finances of your small business should require at a minimum two people to complete.